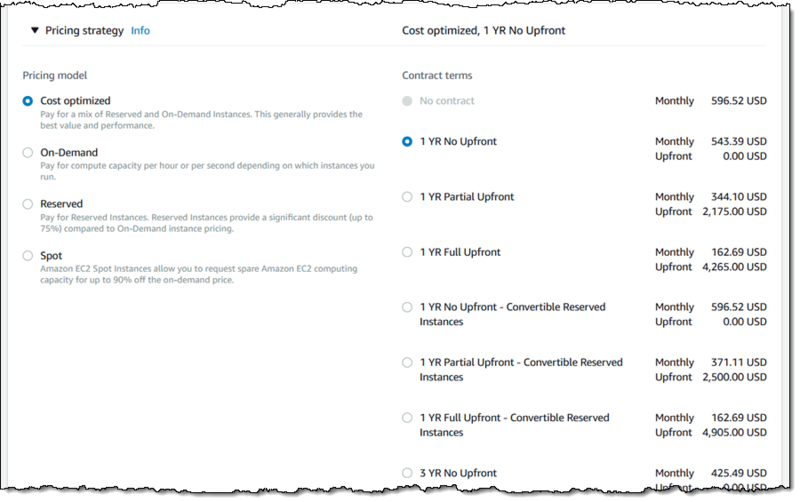 In an amusing coincidence, I was recently asked by two separate customers a nearly identical question: how to import split disks in the form of VMDK to AWS. This post covers one way to do this. There are quite a few names, official and unofficial, for split disks. These include: non-monolithic, split disks, multi-part disks, delta parts, and more. For consistency, I refer to them as split disks in this post. The Image Formats page of VM Import/Export’s documentation specifies the officially supported formats when importing disks and virtual machines. 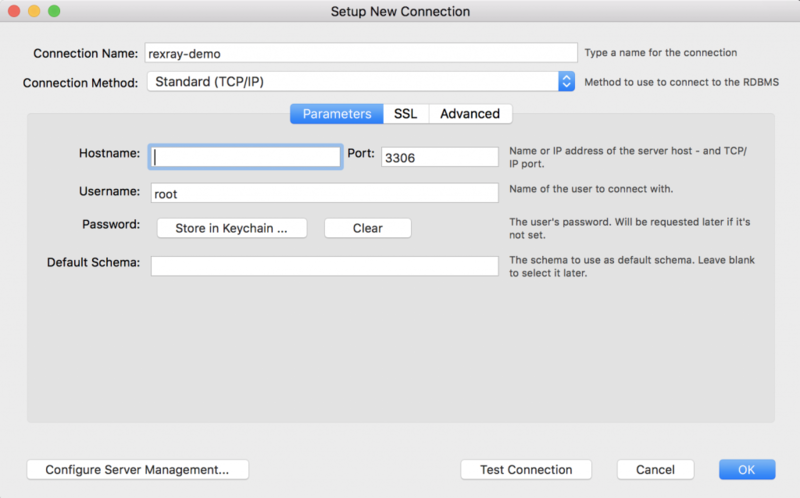 Set up a conversion instance. Convert and build out the new disk image. After the image is imported, you can validate the import and start using the image. 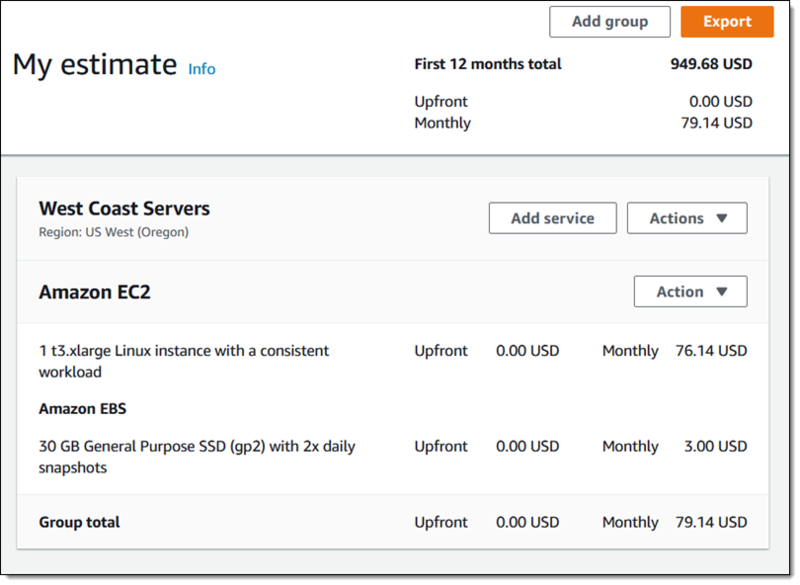 First things first—you need an instance to be used for the conversion job. You can use any machine that is able to run the QEMU image utility. 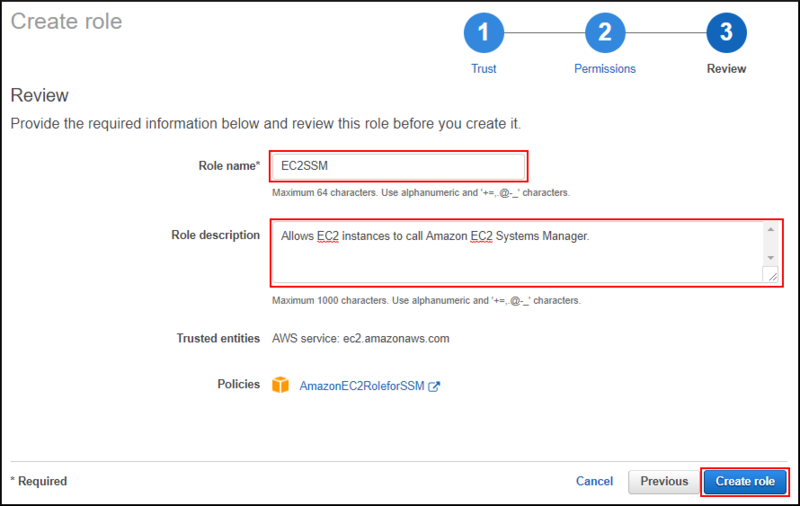 The instance requires the ec2:ImportImage and ec2:DescribeImportImageTasks permissions to be able to run the commands detailed in the steps below. Next, you need your source VMDK files to be available on the machine. 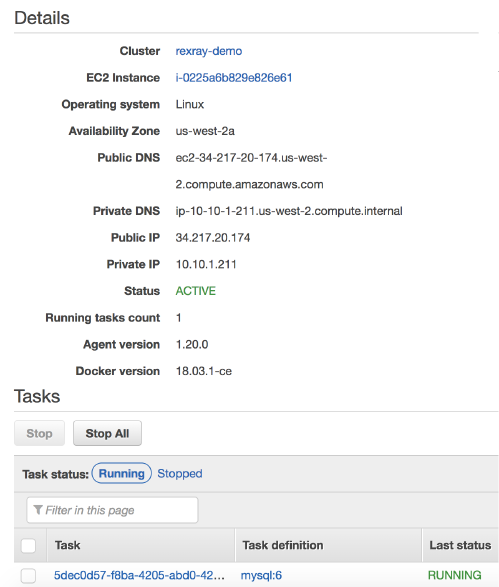 In this case, store on Amazon S3 and copy them over to the EC2 instance. If you examine your source machine’s main .vmdk file, you find the “Extent description” section that specifies the disk parts. Make sure that you’ve got all of them. A quick note about this command, it creates files such as AppServer-s001.vmdk.raw. You could use some command line tinkering and improve the naming convention. Because this post is only a temporary conversion, you can also leave the names as they are. Again, you could optimize this step and merge it into the previous loop. For the sake of clarity, I separated them out. The final step is to import the image, either as a snapshot, or as an image. In this example, use the image option and you can launch several instances off these disks. To import an image or snapshot, the source has to be in an S3 bucket. Create a bucket named “import-blog-post”. 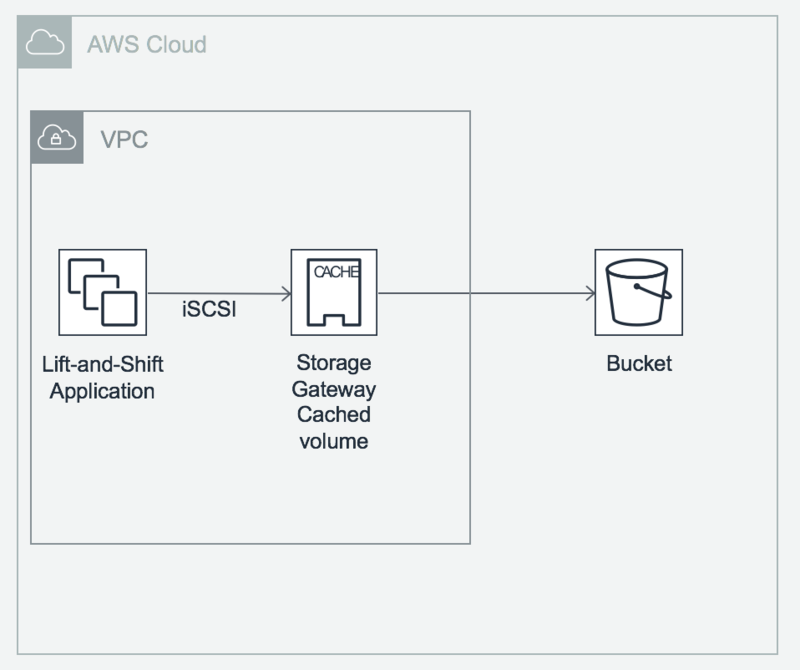 Using the AWS CLI, upload the source to the bucket. The last step is to create an import job. Jobs can represent a physical import (where you ship a physical device containing the data), or an upload of such data. You are specifying the source image format, location (in S3), and a description to be used for the AMI created from it. 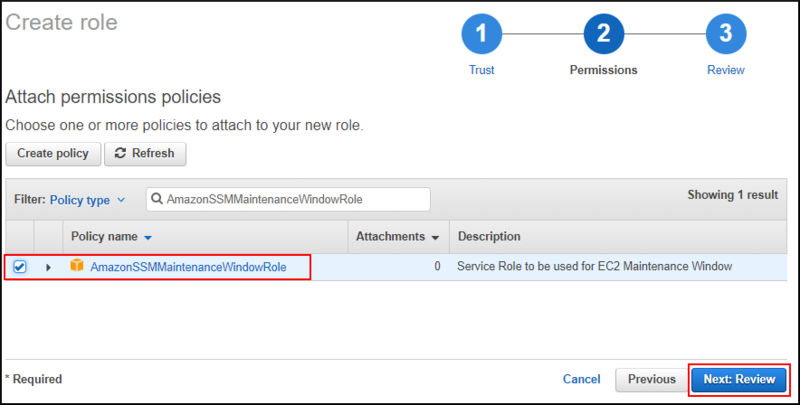 Important: VM Import requires a service role to perform certain operations (such as downloading from S3, creating an image). 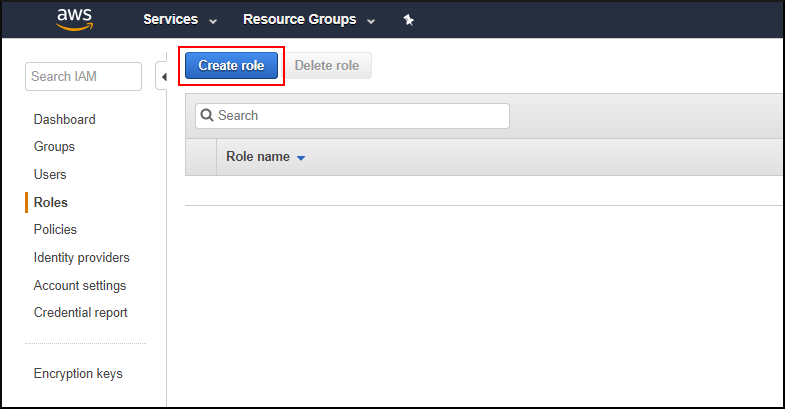 If you do not have a vmimport role, follow the steps from the VM Import Service Role section in the Import Your VM as an Image topic. Additionally, before running the commands, I recommend that you verify that the role has the required access to the S3 bucket used for storing the image. After the status transitions to Completed, you can find a value for ImageId in the response JSON. Start using your newly imported image, via the console, API, or CLI. 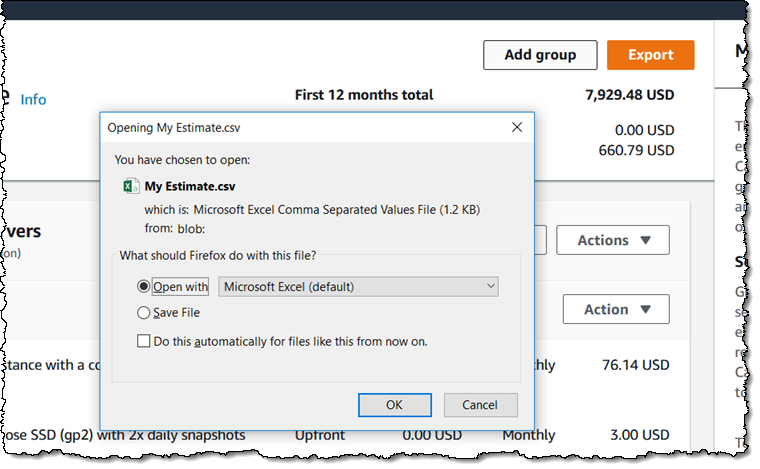 In this post, I presented a process for converting VMDK files, single or multiple, and importing them into AWS. This same process could be used for other source formats, such as QCOW, QCOW2, VDI, and more. 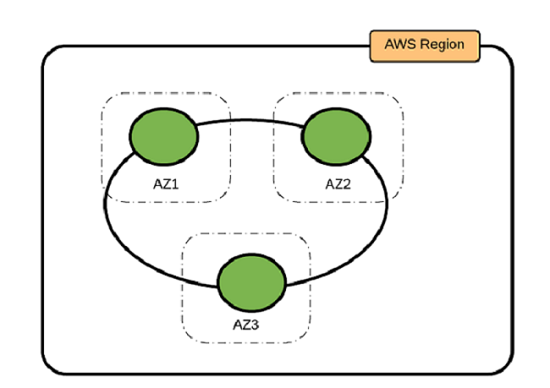 For those of you interested in other options, I would strongly recommend looking at AWS Server Migration Service, which makes it easier and faster to migrate workloads. For information about both partners and software solutions to assist you in such migrations, see Migration Partner Solutions. 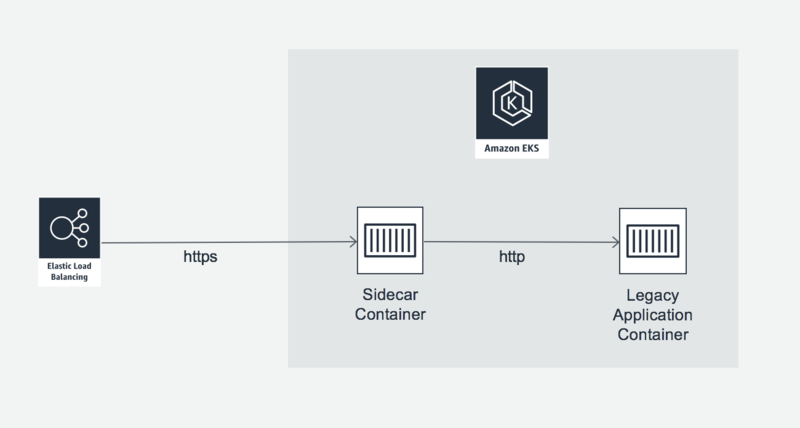 During the design of the Nitro system, we analyzed real-world workloads and recognized the need for smaller instance sizes to drive higher performance from their Amazon EBS volumes. We found that the majority of application storage needs are bursty, with short, intense periods of high I/O and plenty of idle time between bursts. To improve the experience for these workloads, we developed burst capability for smaller instance sizes. 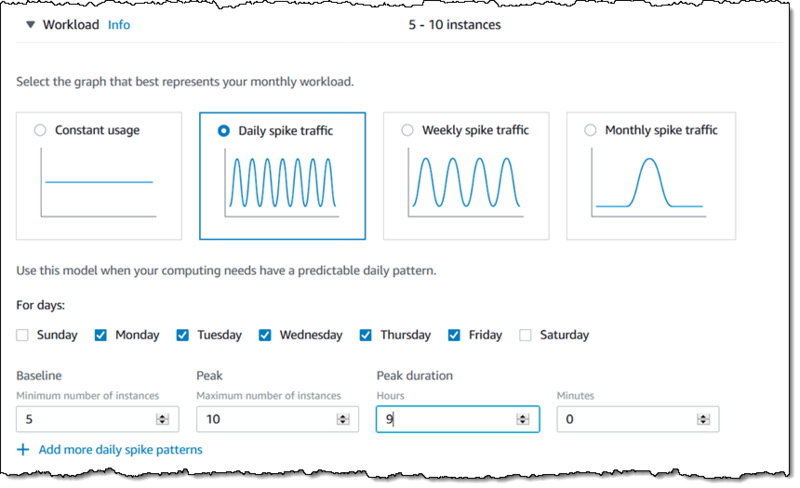 Available on EC2 C5/C5d and M5/M5d instances, this feature enables large, xlarge, and 2xlarge instance sizes to drive the same performance as the 4xlarge instance for 30 minutes each day. The refill rate for a burst bucket is the difference between the baseline rate and the instance I/O activity. For example, m5.large has a baseline throughput rate of 60 MB/s and a baseline IOPS rate of 3600 IOPS. Suppose the instance I/O activity is 10 MB/s and 1000 IOPS. The byte bucket fills at the rate of 50 MB/s (60 MB/s minus 10 MB/s). The IOPS bucket fills at the rate of 2600 IOPS (3600 IOPS minus 1000 IOPS). 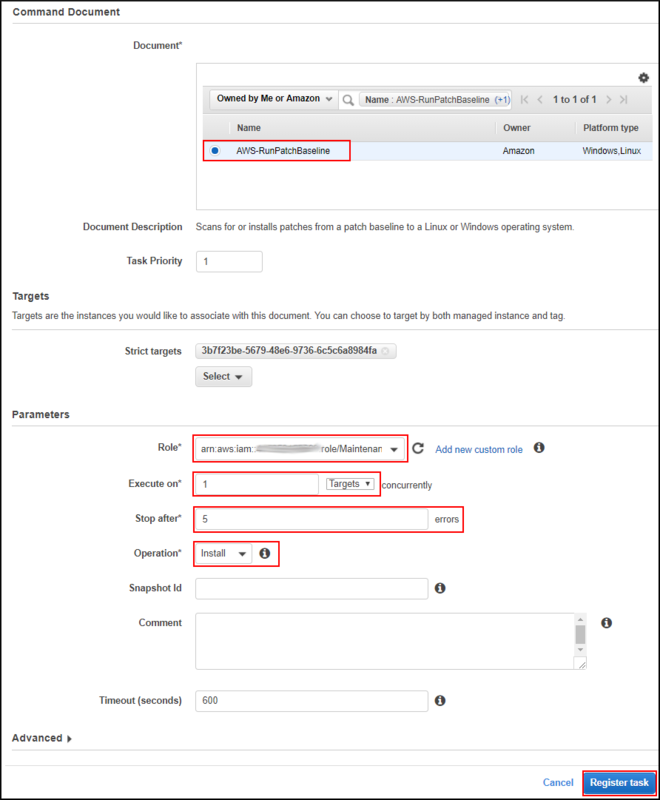 For the baseline rates for the different instances, see Amazon EBS–optimized instances. 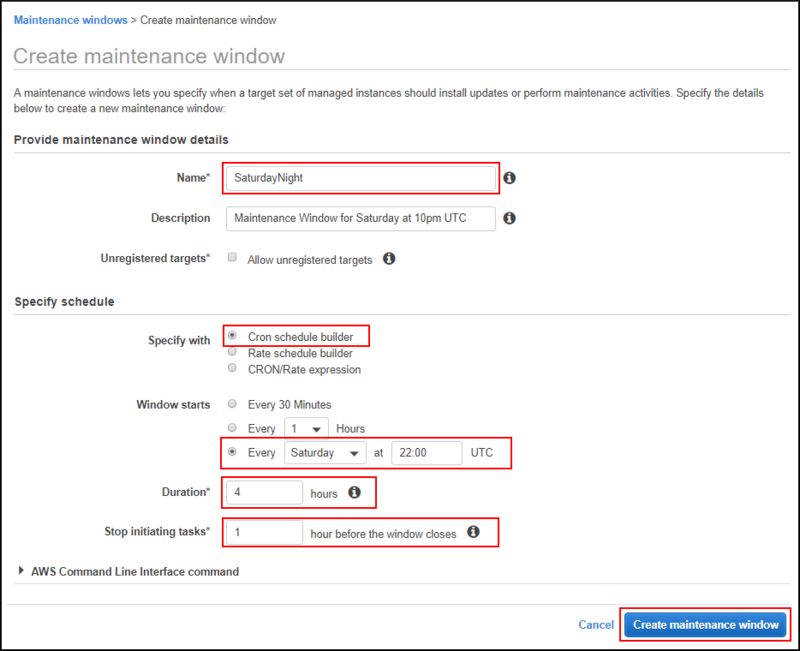 In addition, we top off the burst buckets every 24 hours, which means that the instance has burst performance available for 30 minutes each day. August 2008 – We launched EBS in production form, with support for volumes of up to 1 TB and snapshots to S3. September 2010 – We gave you the ability to Tag EBS Volumes. 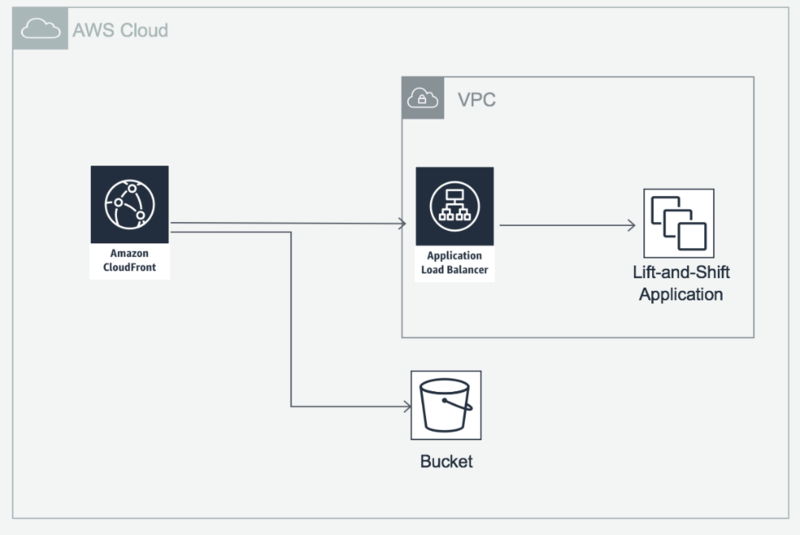 August 2012 – We launched Provisioned IOPS for EBS volumes, allowing you to dial in the level of performance that you need. June 2014 – We gave you the ability to create SSD-backed EBS volumes. March 2015 – We gave you the ability to create EBS volumes of up to 16 TB and 20,000 IOPS. April 2016 – We gave you New cold storage and throughput options. June 2016 – We gave you the power to create Cross-account copies of encrypted EBS snapshots. 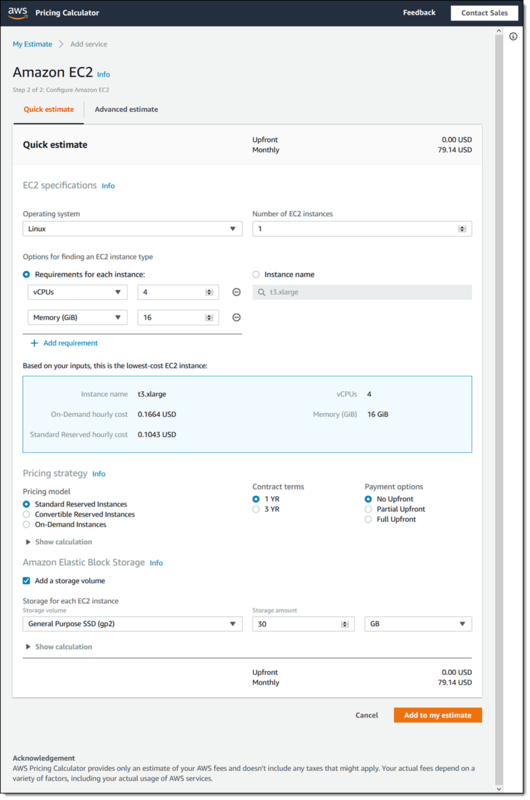 February 2017 – We launched Elastic Volumes, allowing you to adjust the size, performance, and volume type of an active, mounted EBS volume. December 2017 – We gave you the ability to create SSD-backed volumes that deliver up to 32,000 IOPS. May 2017 – We launched Cost allocation for EBS snapshots so that you can assign costs to projects, departments, or other entities. 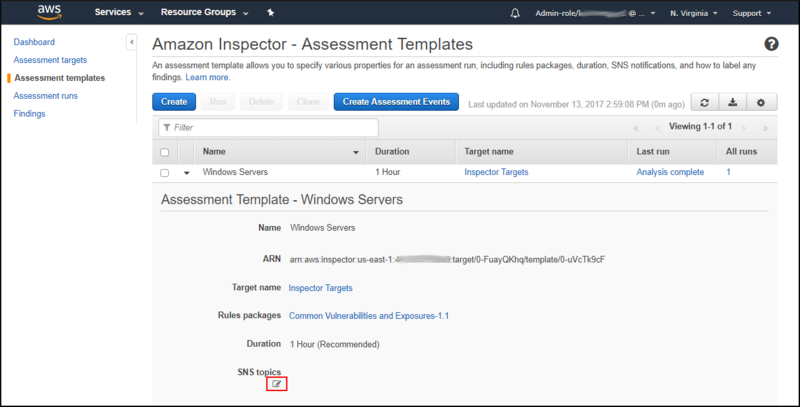 April 2018 – We gave you the ability to Tag EBS snapshots on creation and to Use resource-level permissions to implement stronger security policies. May 2018 – We announced that encrypted EBS snapshots are now stored incrementally, resulting in a performance improvement and cost savings. Several of the items that I chose to highlight above make EBS snapshots more useful and more flexible. As you may already know, it is easy to create snapshots. Each snapshot is a point-in-time copy of the blocks that have changed since the previous snapshot, with automatic management to ensure that only the data unique to a snapshot is removed when it is deleted. This incremental model reduces your costs and minimizes the time needed to create a snapshot. Because snapshots are so easy to create and use, our customers create a lot of them, and make great use of tags to categorize, organize, and manage them. Going back to my list, you can see that we have added multiple tagging features over the years. We want to make it even easier for you to create, use, and benefit from EBS snapshots! 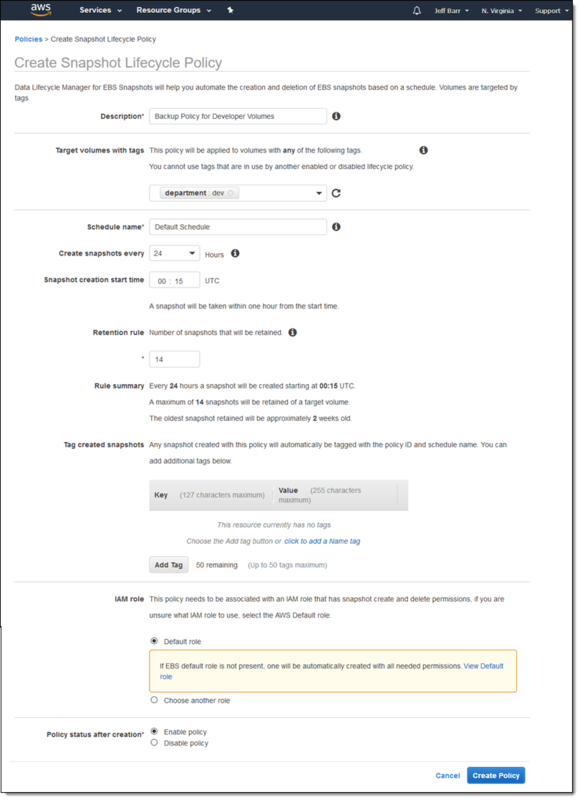 Today we are launching Amazon Data Lifecycle Manager to automate the creation, retention, and deletion of Amazon EBS volume snapshots. 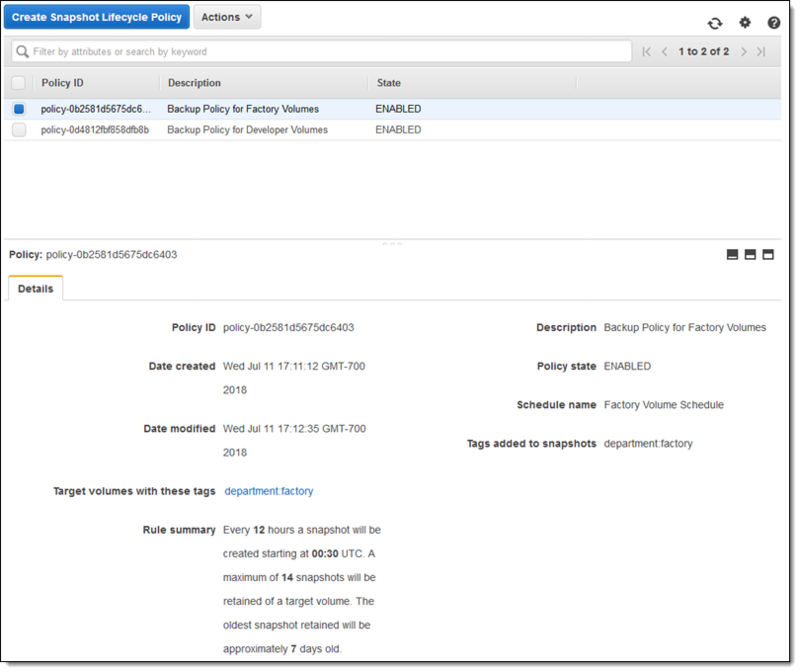 Instead of creating snapshots manually and deleting them in the same way (or building a tool to do it for you), you simply create a policy, indicating (via tags) which volumes are to be snapshotted, set a retention model, fill in a few other details, and let Data Lifecycle Manager do the rest. 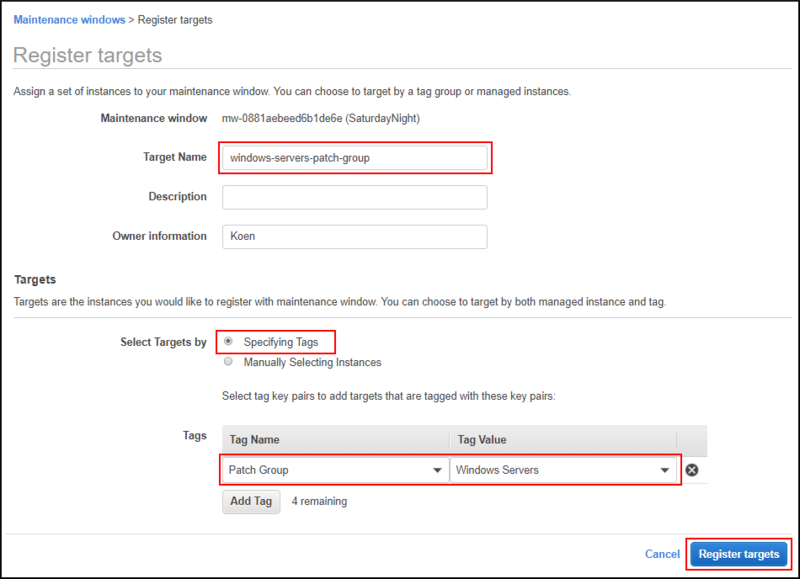 Data Lifecycle Manager is powered by tags, so you should start by setting up a clear and comprehensive tagging model for your organization (refer to the links above to learn more). It turns out that many of our customers have invested in tools to automate the creation of snapshots, but have skimped on the retention and deletion. 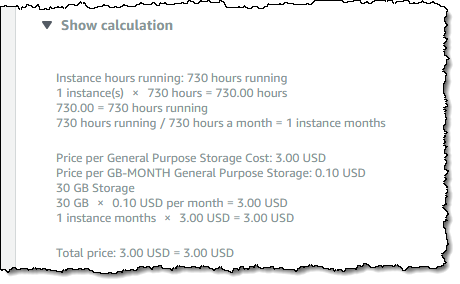 Sooner or later they receive a surprisingly large AWS bill and find that their scripts are not working as expected. 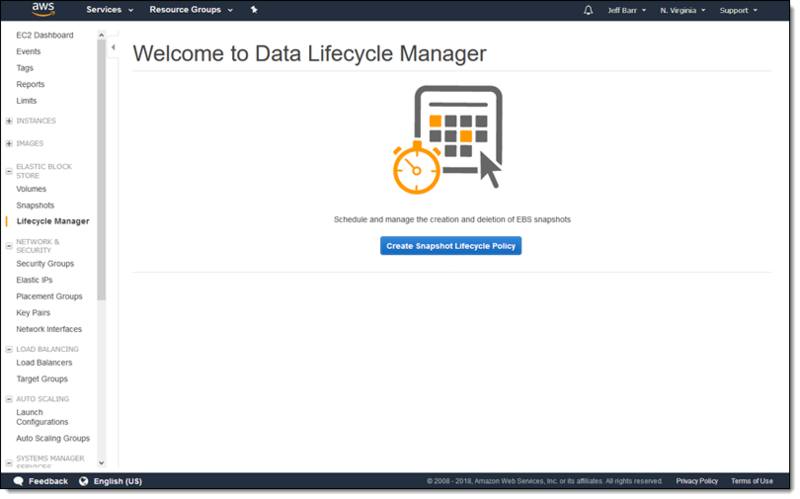 The Data Lifecycle Manager should help them to save money and to be able to rest assured that their snapshots are being managed as expected. I can create snapshots at 12 or 24 hour intervals, and I can specify the desired snapshot time. Snapshot creation will start no more than an hour after this time, with completion based on the size of the volume and the degree of change since the last snapshot. I can use the built-in default IAM role or I can create one of my own. If I use my own role, I need to enable the EC2 snapshot operations and all of the DLM (Data Lifecycle Manager) operations; read the docs to learn more. 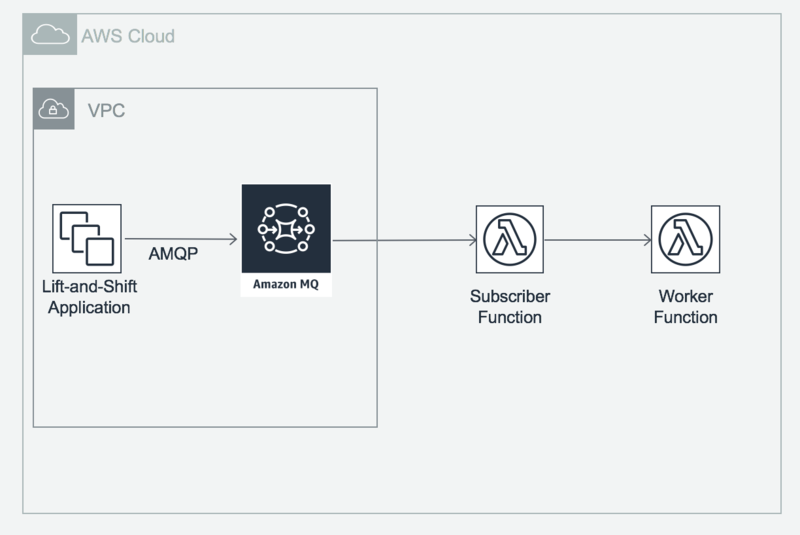 In the Works – As you might have guessed from the name, we plan to add support for additional AWS data sources over time. 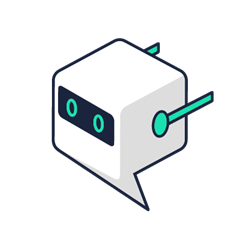 We also plan to support policies that will let you do weekly and monthly snapshots, and also expect to give you additional scheduling flexibility. 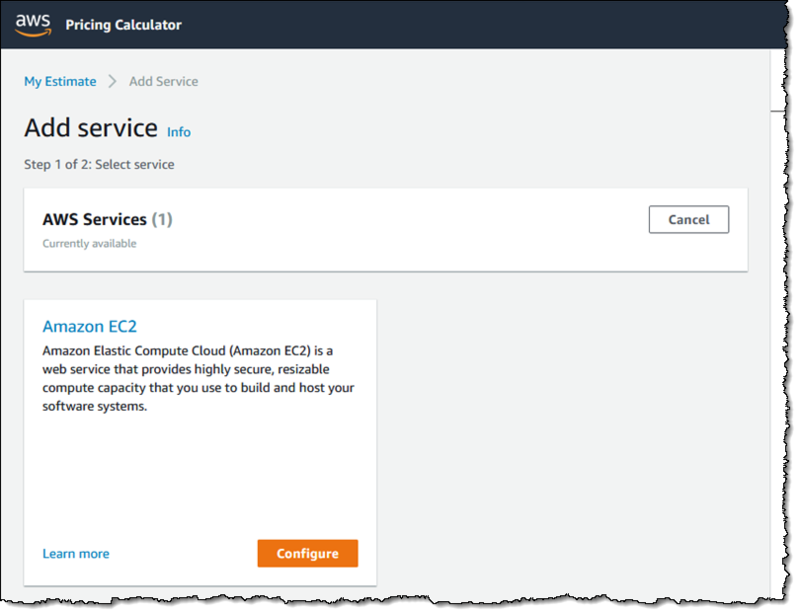 This post contributed by Laura Thomson, Senior Product Manager for Amazon EC2. 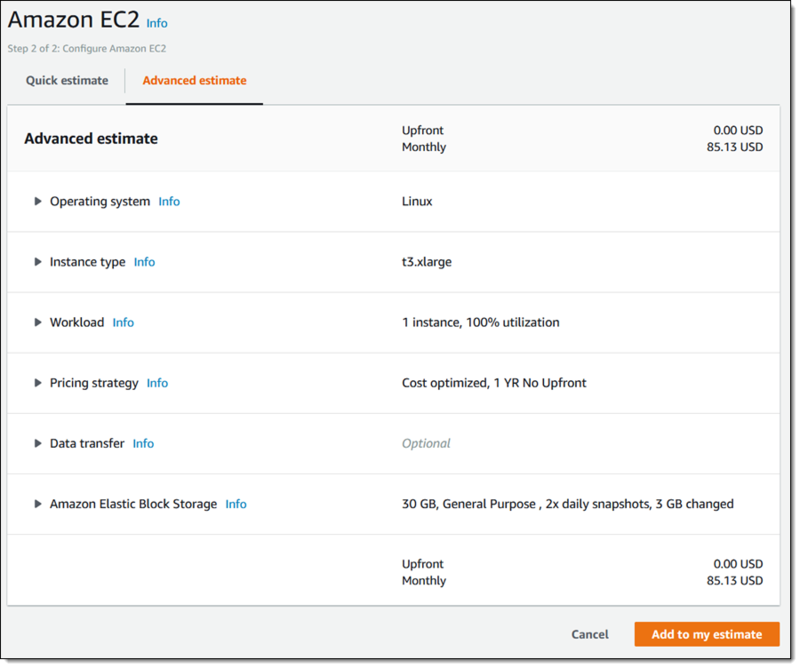 As you start planning for the new year, I want to give you a heads up that Amazon EC2 is migrating to longer format, 17-character resource IDs. 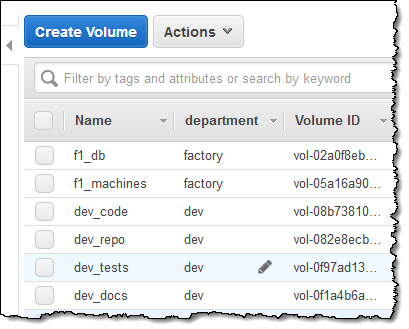 Instances and volumes currently already receive this ID format. 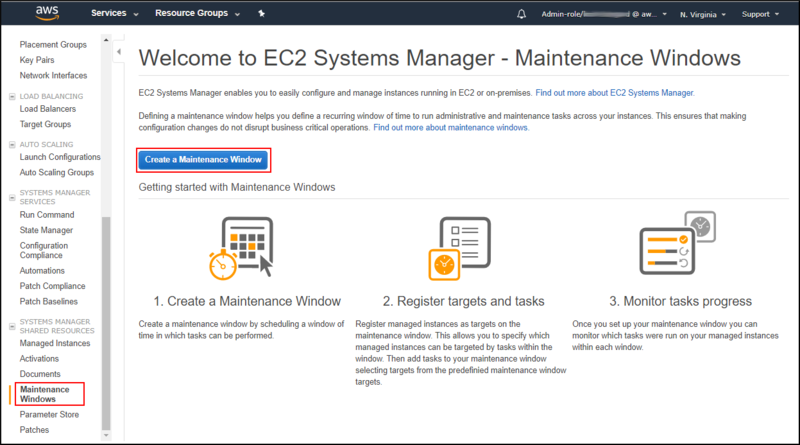 Beginning in July 2018, all newly created EC2 resources receive longer IDs as well. The switch-over will not impact most customers. However, I wanted to make you aware so that you can schedule time at the beginning of 2018 to test your systems with the longer format. 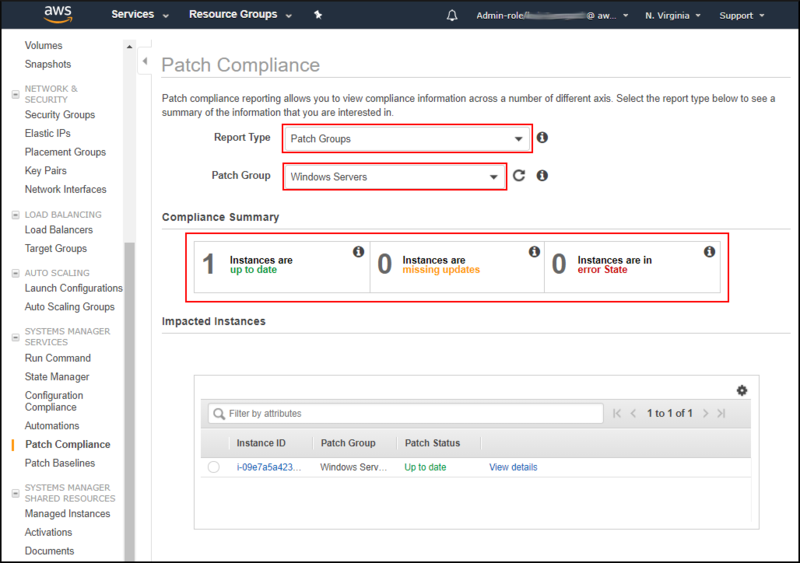 If you have a system that parses or stores resource IDs, you may be affected. From January 2018 through the end of June 2018, there will be a transition period, during which you can opt in to receive longer IDs. 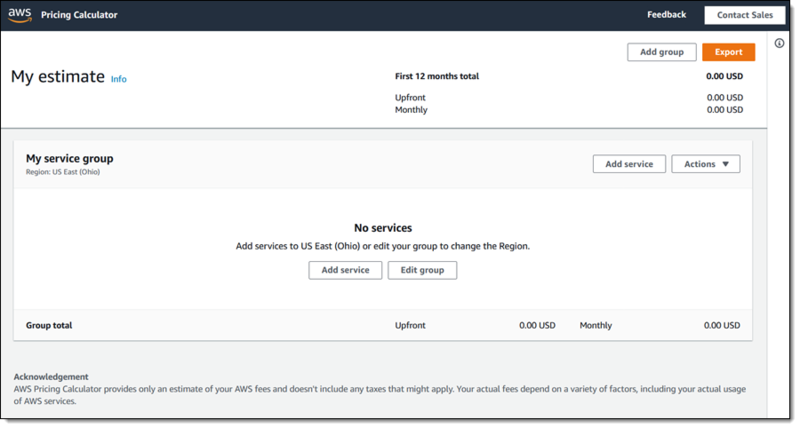 To make this easy, AWS will provide an option to opt in with one click for all regions, resources, and users. 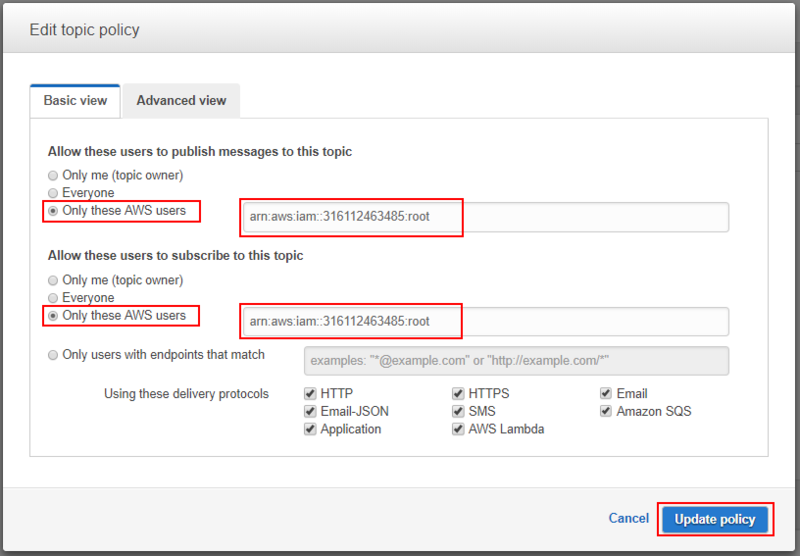 AWS will also provide more granular controls via API operations and console support. More information on the opt-in process will be sent out in January. 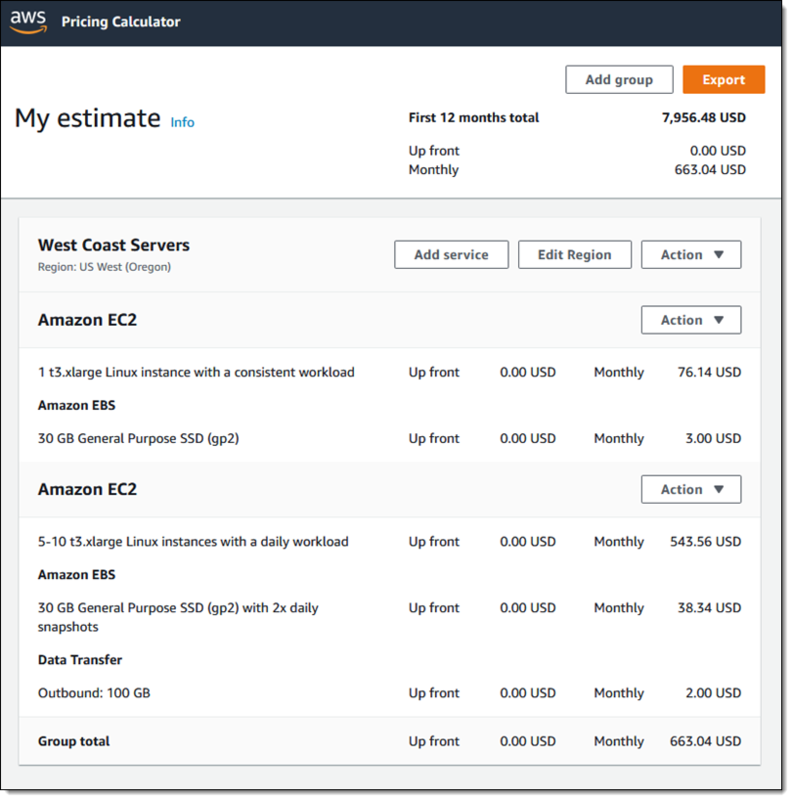 We need to do this given how fast AWS is continuing to grow. We will start to run low on IDs for certain resources within a year or so. In order to enable the long-term, uninterrupted creation of new resources, we need to move to the longer ID format. The current format is a resource identifier followed by an eight-character string. The new format is the same resource identifier followed by a 17-character string. 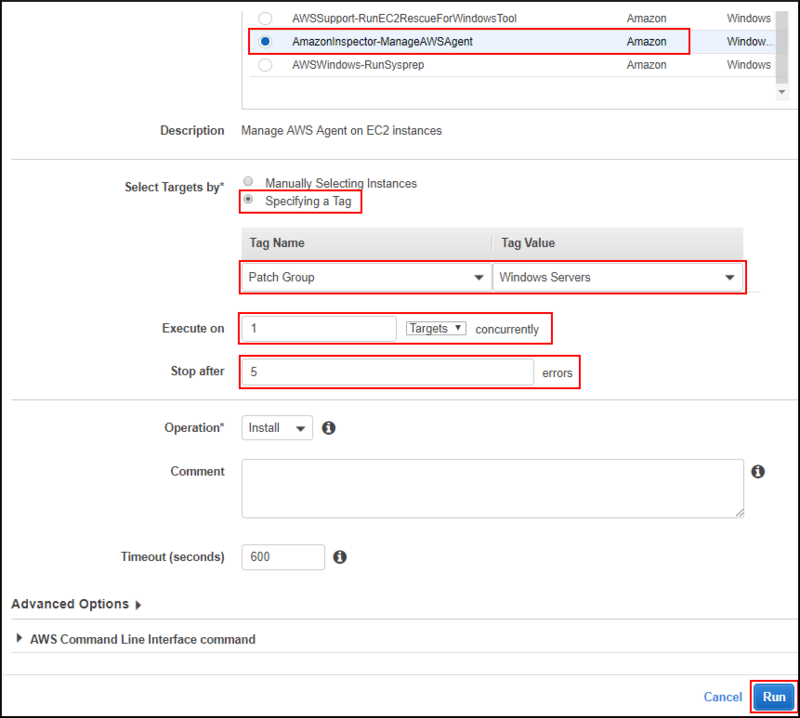 For example, your current VPCs have resource identifiers such as “vpc-1234abc0”. Starting July 2018, new VPCs will be assigned an identifier such as “vpc-1234567890abcdef0”. You can continue using the existing eight-character IDs for your existing resources, which won’t change and will continue to be supported. Only new resources will receive the 17-character IDs and only after you opt in to the new format. 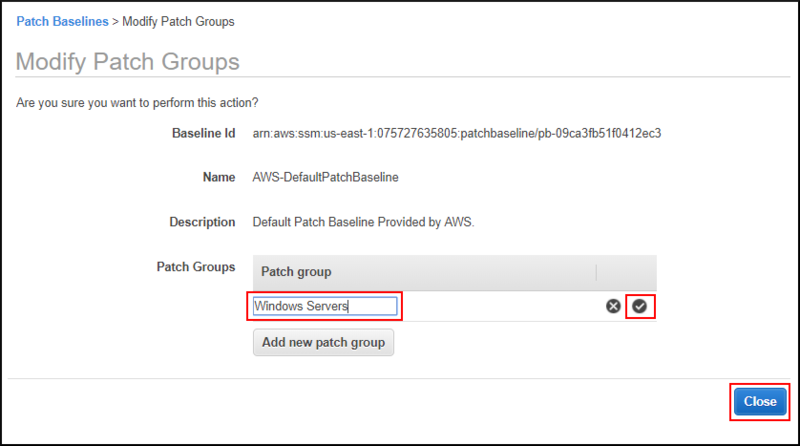 For more information, see Longer EC2, EBS, and Storage Gateway Resource IDs. 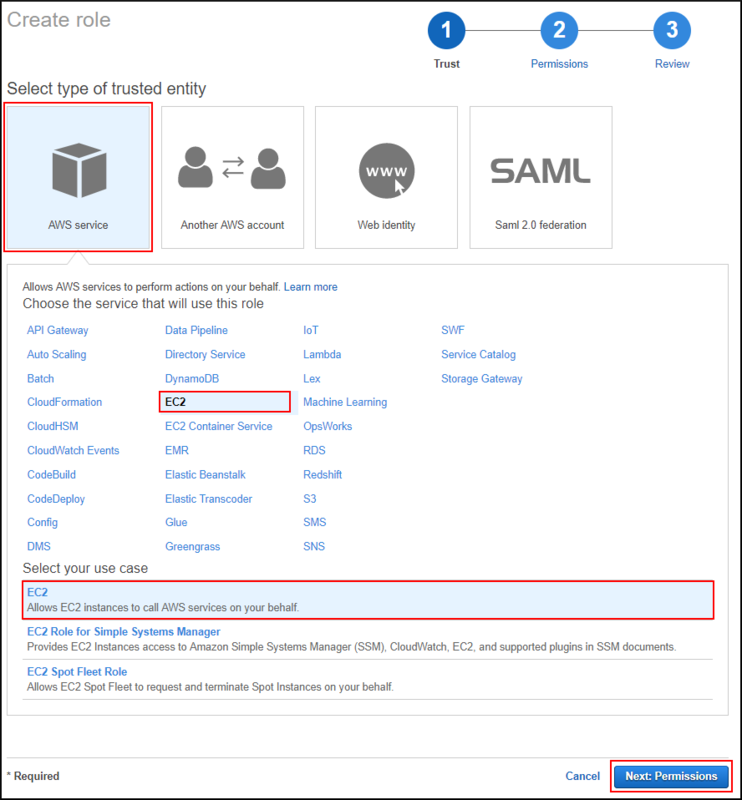 If you have any questions, contact AWS Support on the community forums and via AWS Support. 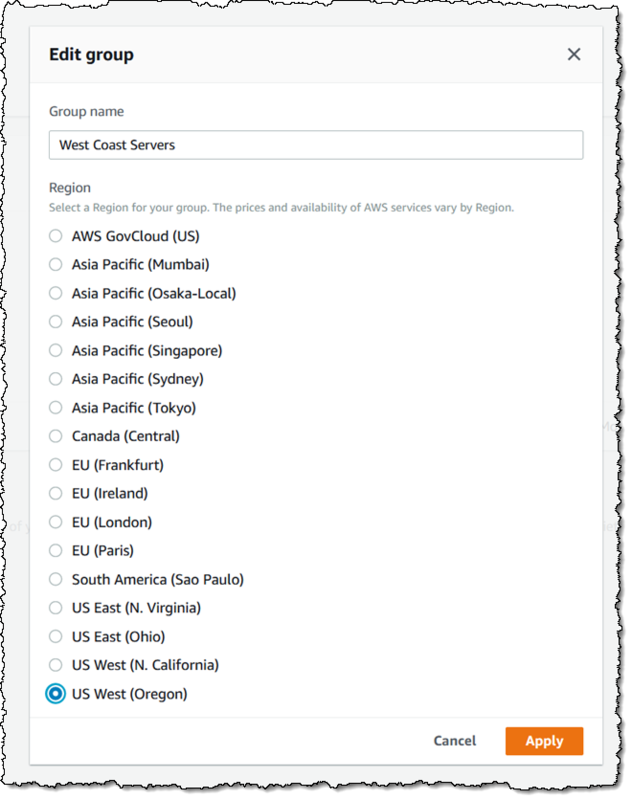 You probably store persistent data in Amazon EBS volumes, which live within a single Availability Zone. 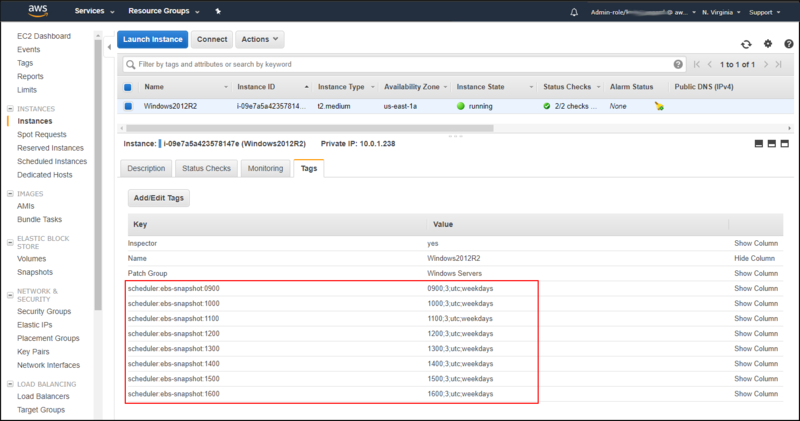 And, following best practices, you take snapshots of your EBS volumes to back up the data on Amazon S3, which provides 11 9’s of durability. If you are following these best practices, then you’ve probably recognized the need to manage the number of snapshots you keep for a particular EBS volume and delete older, unneeded snapshots. Doing this cleanup helps save on storage costs. 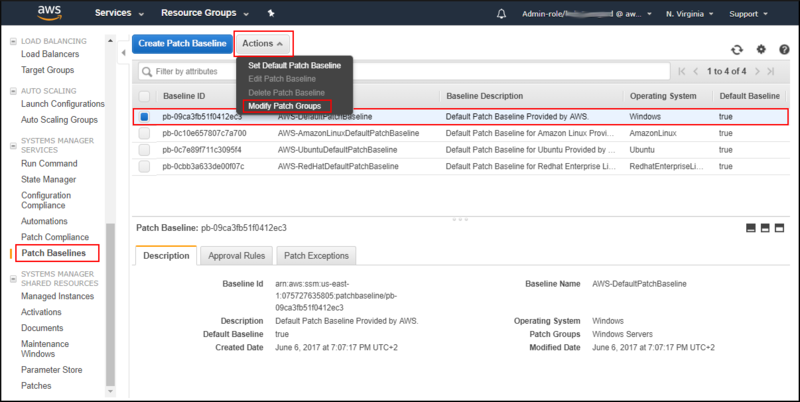 One of the most powerful AWS services released in 2016 was Amazon CloudWatch Events. 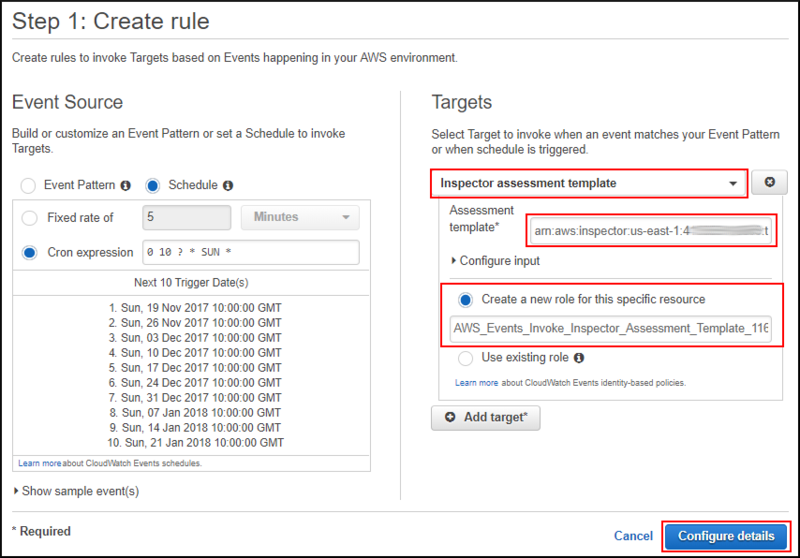 It enables you to build event-driven IT automation, based on events happening within your AWS infrastructure. 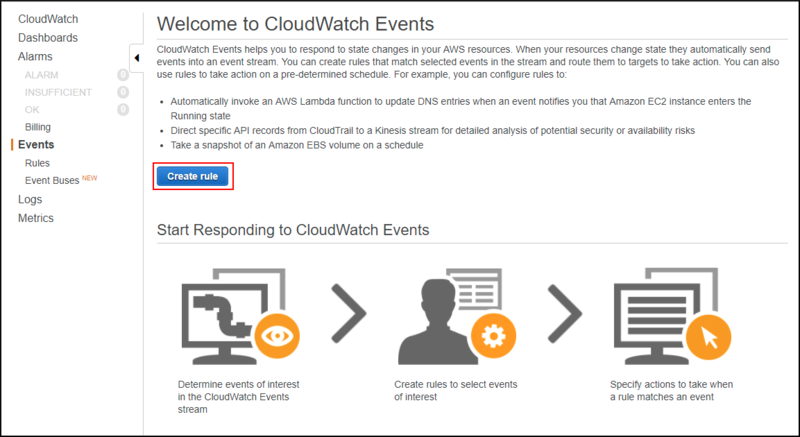 CloudWatch Events integrates with AWS Lambda to let you execute your custom code when one of those events occurs. However, the actions to take based on those events aren’t always composed of a single Lambda function. 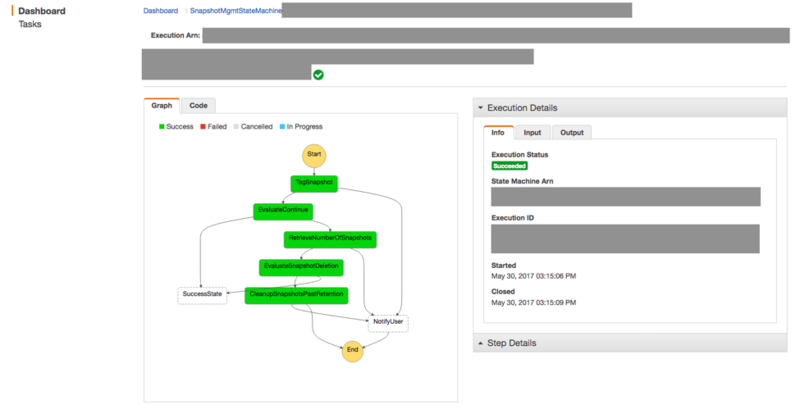 Instead, your business logic may consist of multiple steps (like in the case of the example snapshot management flow described earlier). And you may want to run those steps in sequence or in parallel. You may also want to have retry logic or exception handling for each step. 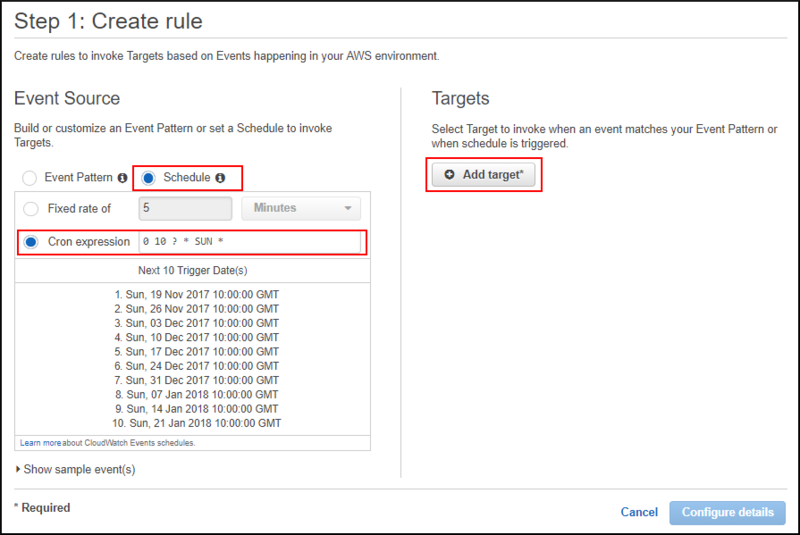 As an example of what you could do with Step Functions and CloudWatch Events, we’ve developed a reference architecture that performs management of your EBS snapshots. 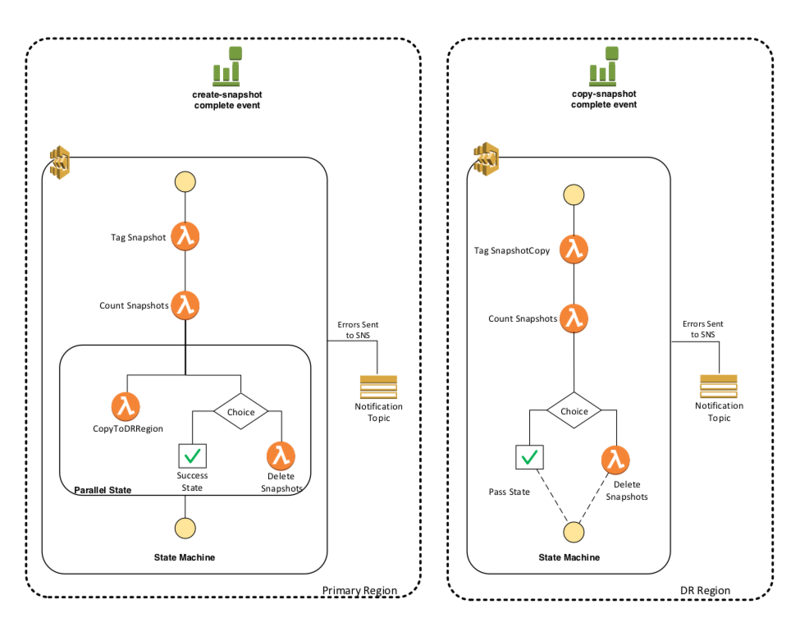 I’ve also provided CloudFormation templates that perform all the earlier setup without using git clone and running the CloudFormation commands. Choose the Launch Stack buttons below to launch the primary and DR region stacks in Dublin and Ohio, respectively. 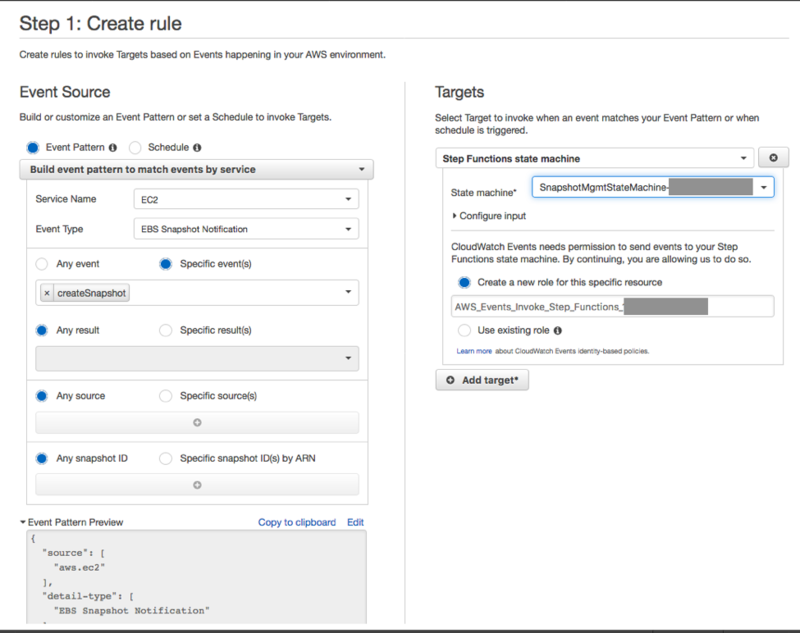 From there, you can pick up at the Testing in Your Account section above to finish the example. 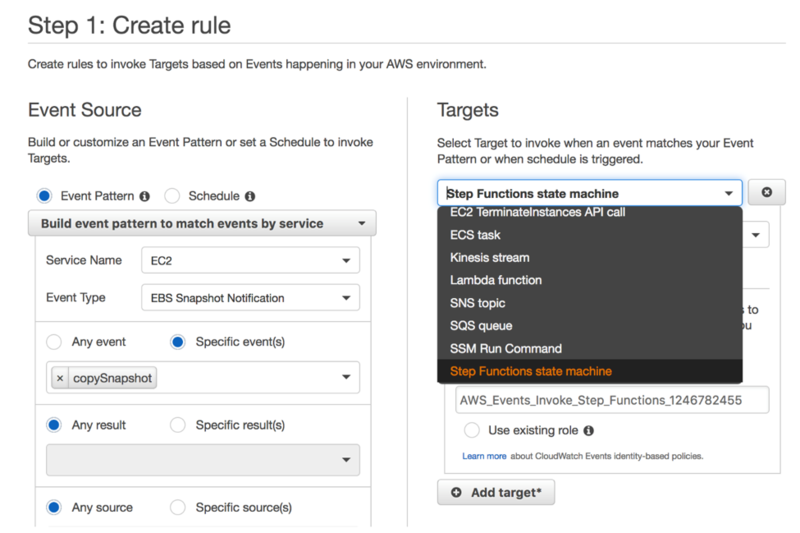 All of the code for this example architecture is located in the aws-step-functions-ebs-snapshot-mgmt AWSLabs repo.